Jacuzzi on the deck for relaxing after a day at the beach. 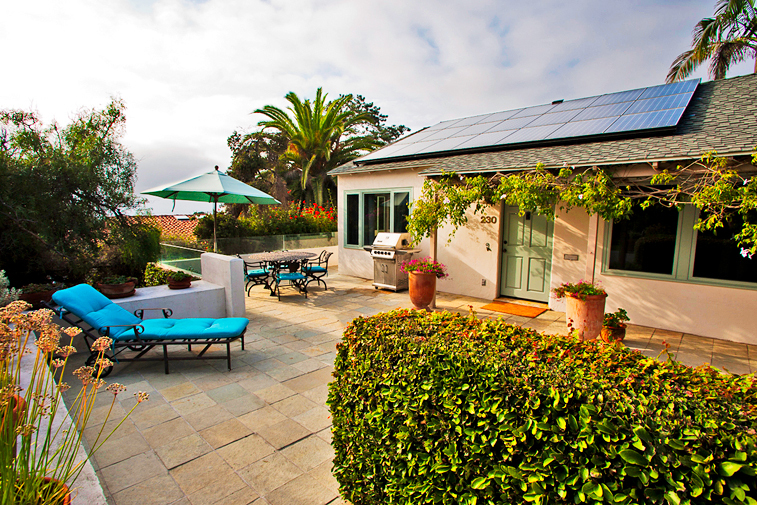 Del Mar Beach Beauty is a private home with Ocean Views. 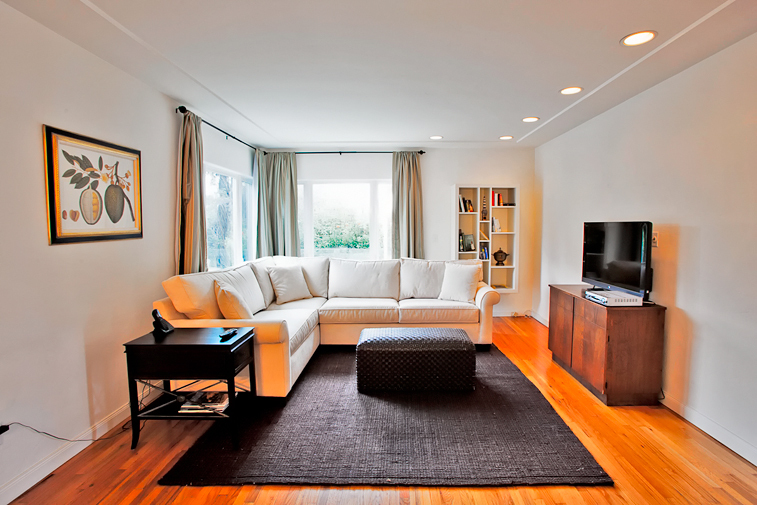 Living room has plenty of seating and large flat screen TV. 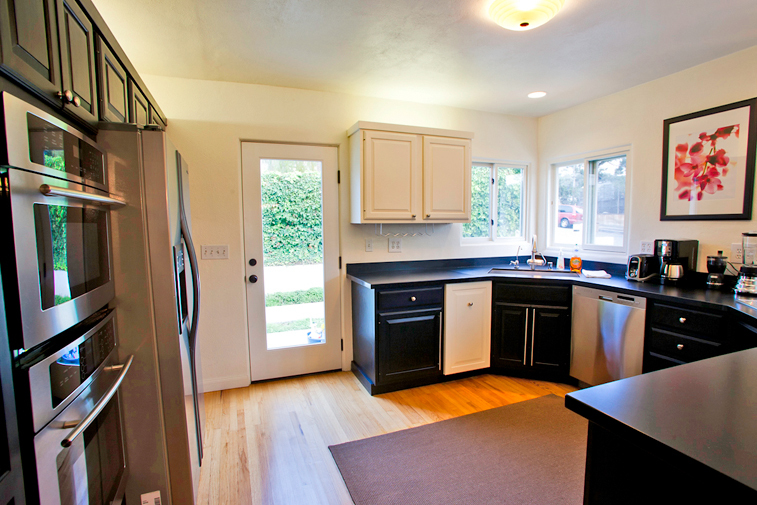 Fully equipped kitchen has everything you need to enjoy preparing meals in this home. Dining area has seating for 6 people. Master bedroom has king sized bed, flat screen TV, en suite bathroom and French doors opening out onto the deck. 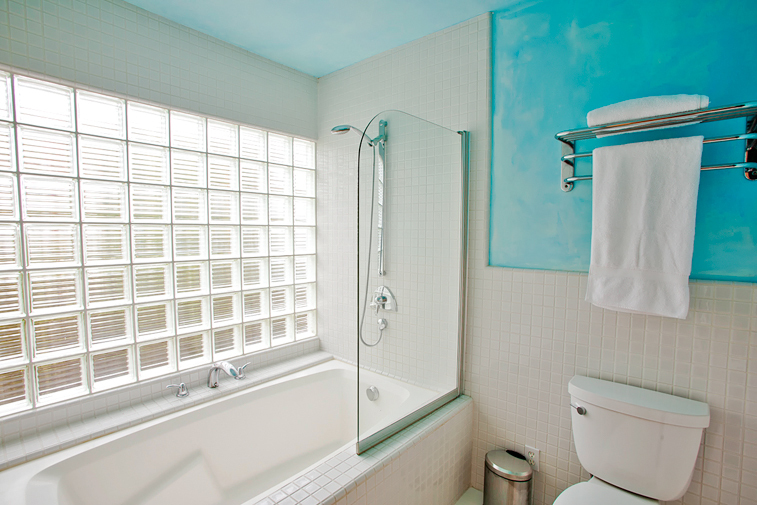 Master Bath features glass block windows for plenty of natural light. 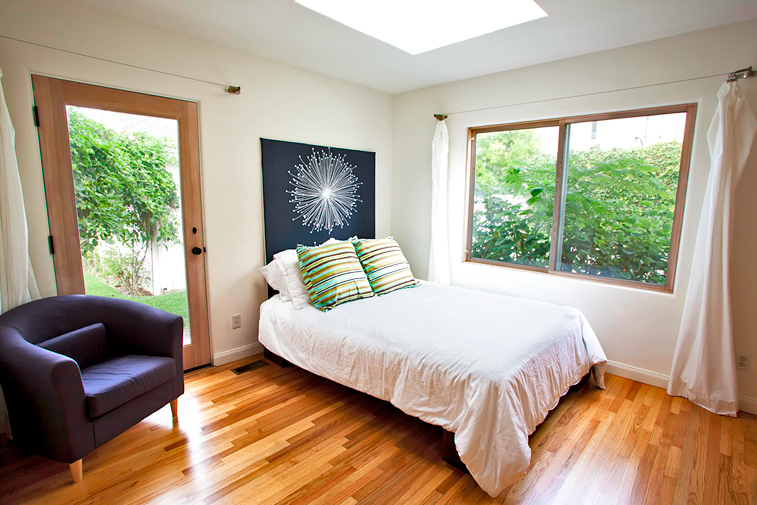 2nd bedroom has queen bed, flat screen TV and door out to a beautifully landscaped area. 3rd Bedroom has queen sized bed, flat screen TV, and patio doors. 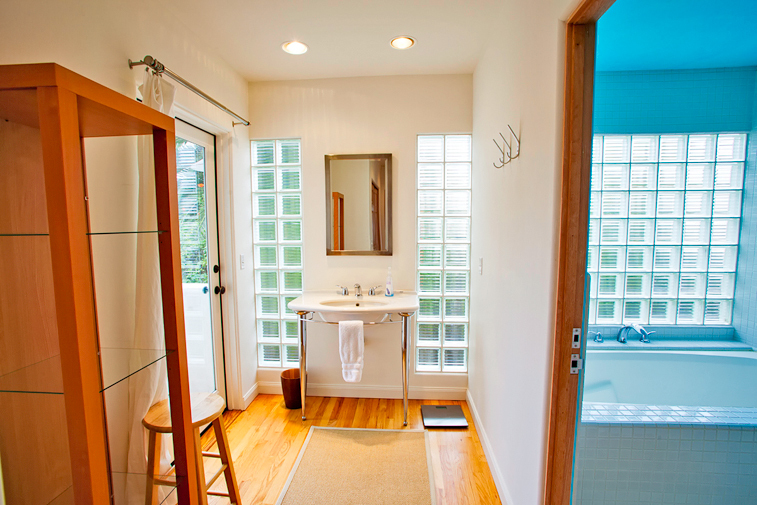 Main Bathroom has full tub with shower and is assessable to both bedrooms. Master Bathroom has soaking tub and shower. 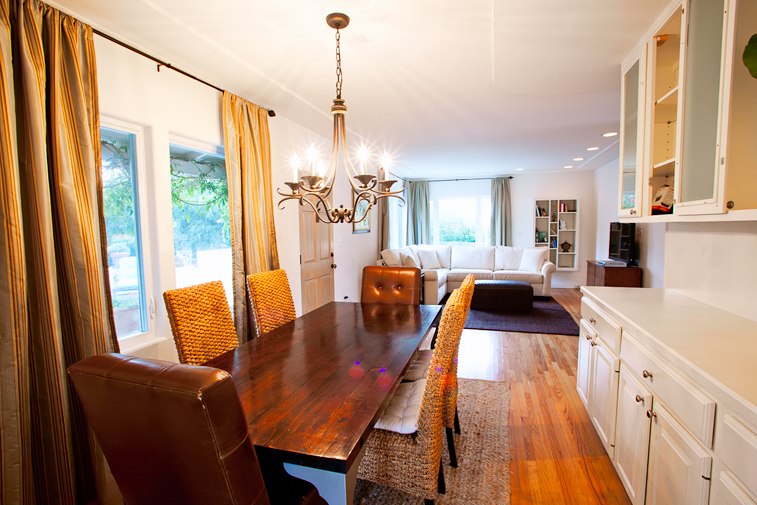 Living and Dining area are open for socializing and family time. Open floor plan and soothing colors create a peaceful ambiance. 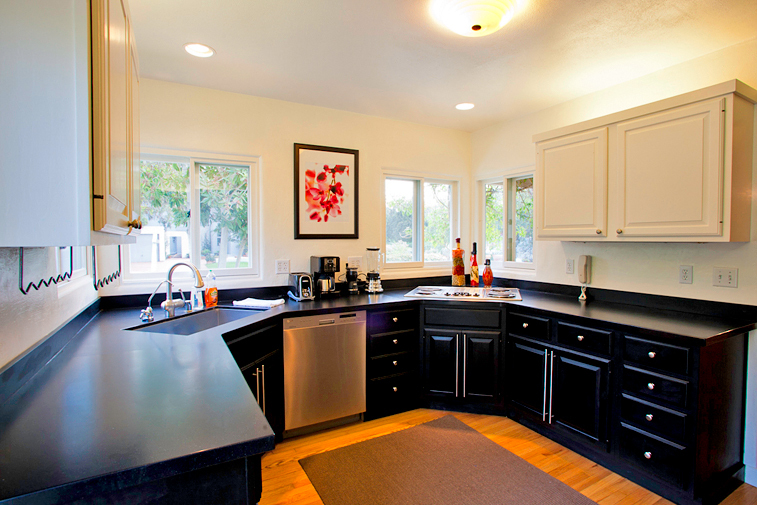 Top of the line appliances and custom cabinets in the modern Kitchen. Deck off the Master Bedroom. Private fenced yard, perfect for pets to roam. 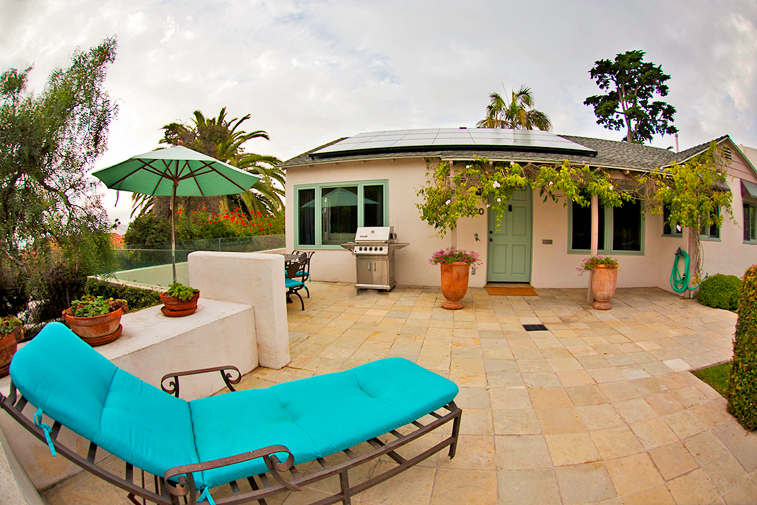 Beautiful flagstone patio for soaking up the sun or dining alfresco, with sunset and ocean views. 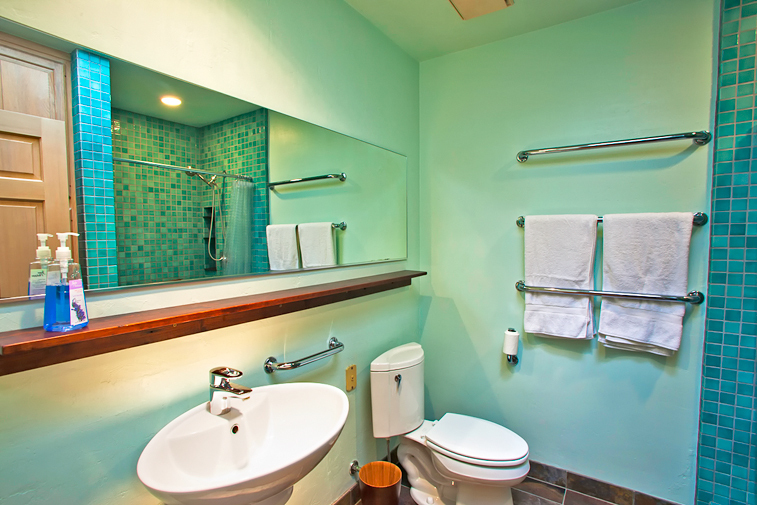 - three spacious bedrooms and two modern bathrooms. 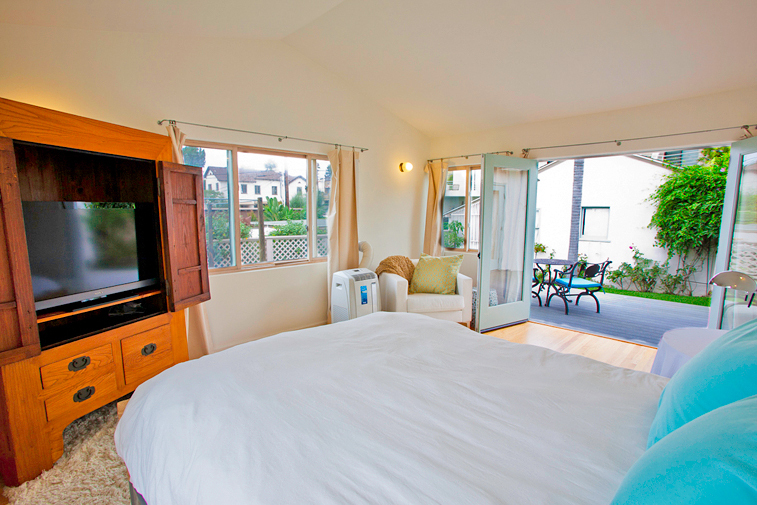 The master bedroom has a partial ocean view, a king sized bed, and a private bathroom. 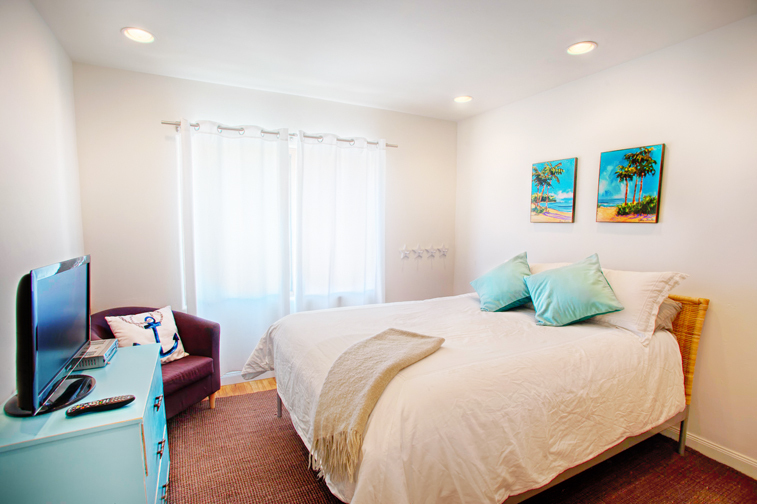 The two additional bedrooms both have queen sized beds and share a bathroom. 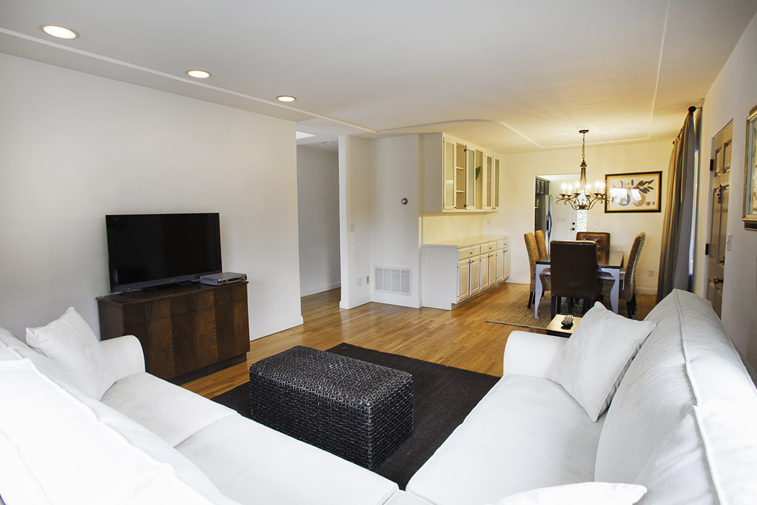 - Relaxing and spacious living room with comfortable couches and a large flat screen TV. 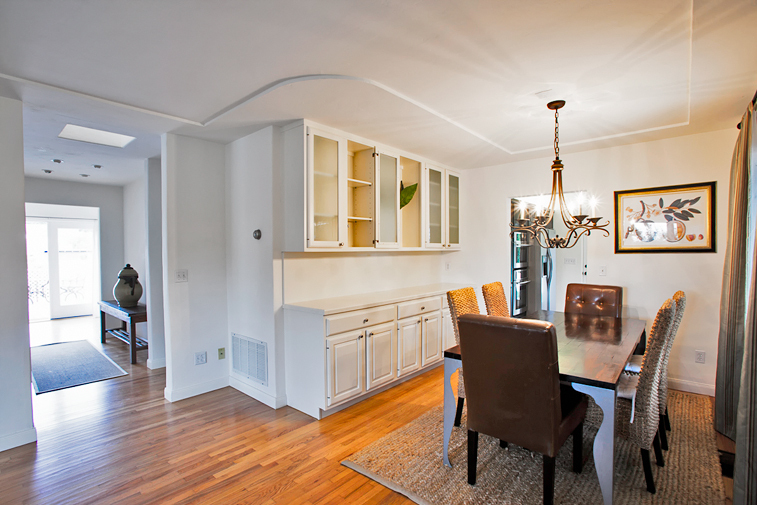 - Fully stocked kitchen and large dining room table perfect for cooking your meals at home or entertaining guests. 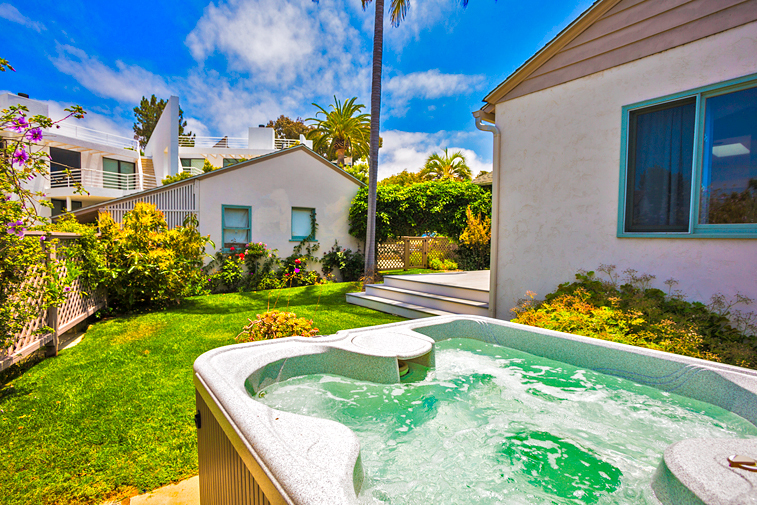 - A beautiful backyard with private Jacuzzi hot tub and spacious deck perfect for enjoying the Southern California sunshine. - Ocean view front patio with BBQ and outdoor seating so can can cook your dinner outside while enjoying the beautiful sunsets and lounging on the patio. 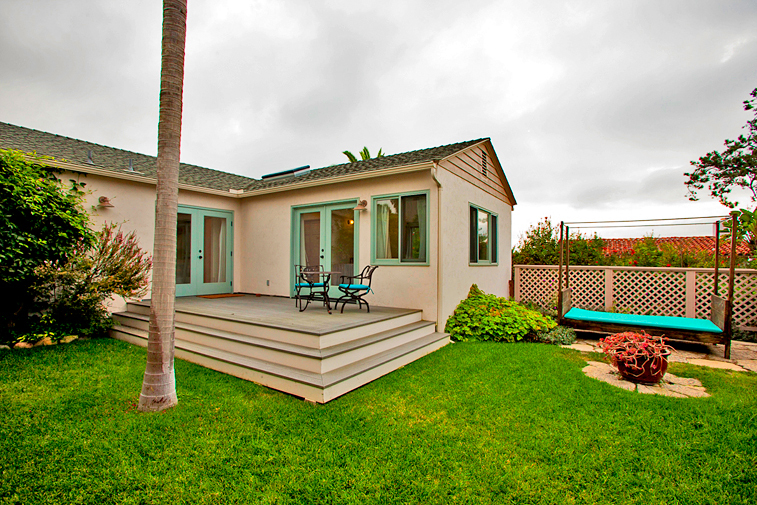 This beautiful home is walking distance to the town of Del Mar where you will find fabulous restaurants and shopping. 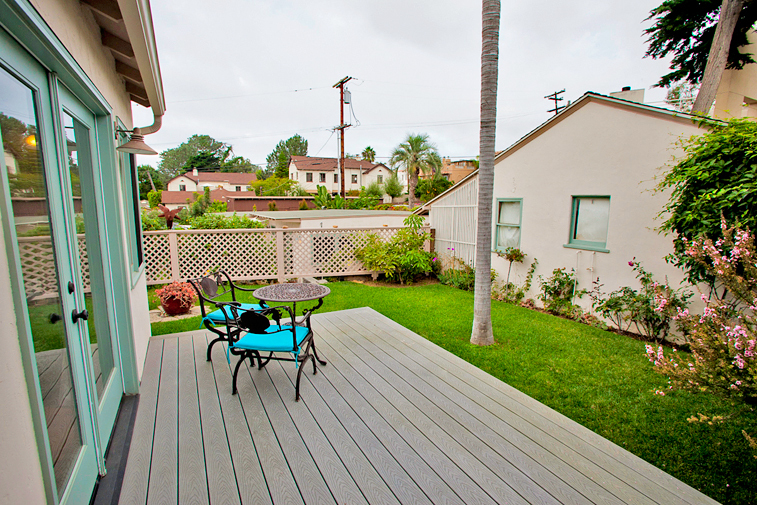 It is also walking distance to the incredible Del Mar beaches! Del Mar Beach Beauty is the perfect getaway and has everything you need for the perfect Southern California beach getaway. Charming home. Walking distance to the track and all the shops and restaurants along the way. Beach is just a couple blocks away. - Reviewed By Robert M.
- Reviewed By Kiera L.
We rent this house for a family Vacation, it was perfect... it is one of those houses that is actually better in person than even the photos! the location is amazing, bedding was super comfy... I would say a great house for family's or a romantic getaway, the master is beautiful.. we will be back! - Reviewed By Shelley L.
- Reviewed By Amanda M.
- Reviewed By Geroge A. We just spent 1 MONTH in this nice rental property. The home is clean, functional and updated. Comfortable beds and living areas and lots of storage. Nice appliances including great laundry room. No covered parking, but the narrow driveway is very deep (2 cars could fit) and street parking is usually available. Really enjoyed the hot tub and fenced backyard. All the front and rear lawn areas are artificial turf which is visually pleasing and was fine for our stay in winter. The location is very nice for access to city center (restaurants) and sunset viewing at end of 11th. The train noise was not bad. Property Management company is professional and responsive with great use of technology for reservation management. Our stay in Del Mar could not have been more perfect! It was close to town, the beach and the family, when they were visiting. Easy for my 80+ year old parents, quiet and convenient parking off street. We all want to book this great hose again for next year!!! This is a great little house. Well decorated and close to beach and town. Loved it! A group of friends and I stayed here for a Memorial Day getaway and we all had an excellent time. The house is clean with lots of community spaces in the front and backyard. You're also a 5 minute walk from the 11th St beach which has great surf! highly recommend especially if surfing is an important part of your trip. Everything was perfect!!! The home was extremely clean upon our arrival. The management company was very helpful and easy to work with. They arranged to have someone do our grocery shopping and deliver to the home before we arrived. We plan to stay here every time we are in Del Mar. Thank you for a wonderful vacation..
We had a very nice stay in Del Mar at this property. We loved that it is walking distance to everything. It was the perfect size for me and my two older daughters. We will return! We loved being at this rental house, fabulous location, easy walking distance to shops and gorgeous beach. We'll be back! Very clean and conveniently located.